The exchange of solar energy through the Chukchi Sea—especially in the zone between the sea surface and about 30 meters depth—is one of the prime regulators of the Arctic climate, its sea ice cover, and its ecosystems. Yet for polar scientists, the Chukchi Sea and other seasonally ice-covered marginal seas are among the most challenging regions to study. 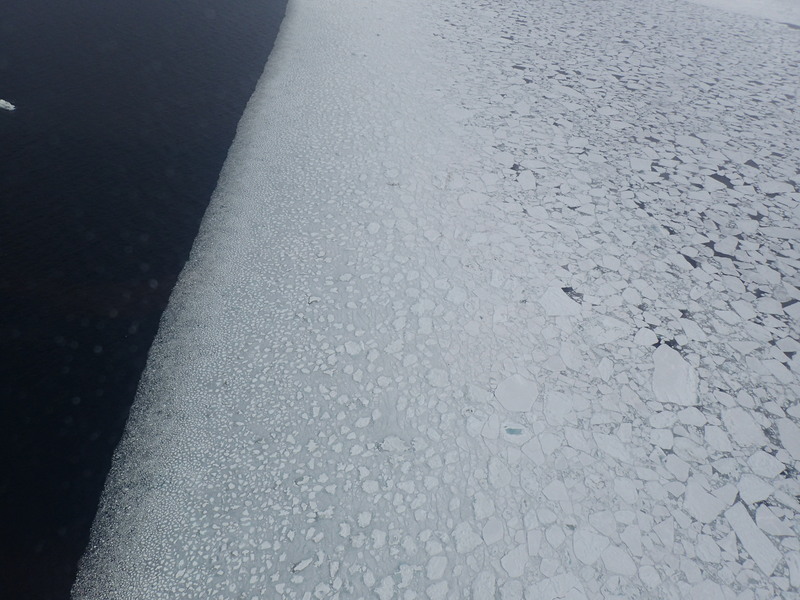 This is because for much of the year the sea ice is not stable enough to deploy equipment on and it can easily wreck most instruments in the upper water column. Ships and satellites only provide limited access to this domain. The lack of observations hampers sea ice and weather forecast services and impedes the progress of research in the region. This project aims to bridge the upper ocean observation gap in the Arctic marginal seas through the deployment of innovative new autonomous platforms like Marine Robotic Vehicles (MRV) Air-Launched Autonomous Micro-Observer (ALAMO) float, in combination with a more traditional suite of weather and ocean-sensing instrumentation carried aboard a specially-modified NOAA Twin Otter aircraft (NOAA 56). Together these systems promote the synthesis of the ocean and atmospheric data that span the range from satellite remote-sensing to sub-surface oceanographic moorings. The flexibility and endurance of the Twin Otter means that autonomous floats can be launched and data rapidly collected over a wide area, when and where needed. The scientific objectives of the Arctic Heat experiment include monitoring rates of upper ocean temperature change and water mass transformation over entire seasons, from the time the sea ice begins to retreat in the spring through freeze-up in the autumn, and even over the winter. With this data we will also be able to better interpret the relationship between satellite- and aircraft-based radiometer measurements of the ocean's surface temperature (SST) and temperatures at depth detected by profiling floats and expendable probes. Real-time data will also be assimilated in weather and sea-ice forecast models. In addition, a number of engineering research and development studies designed to explore the capabilities of the ALAMO float will be carried out. Arctic Heat is an open science experiment. We are publishing data as soon as possible after it is collected on this website, on the Woods Hole Oceanographic Institution ALAMO website (http://alamo.whoi.edu), and on the Global Telecommunications System (GTS). This is being done to facilitate the timely delivery of observations for use in weather and sea-ice forecasts, to make data readily accessible for model and reanalysis assimilation, and to support ongoing research activities across disciplines. Open data amplify the broader impact of science and forecast services on the safety and economic viability of marine and coastal community activities in Alaska. We request that researchers notify us at oar.pmel.arctic-heat.webmaster@noaa.gov when they use these data, and to cite this website as appropriate: Wood, K.R., S.R. Jayne, C.W. Mordy, and J.E. Overland. 2016. Arctic Heat Open Science Experiment. Retrieved from https://www.pmel.noaa.gov/arctic-heat/. About the Banner Image: Photo of the decaying seaward edge of the shore-fast ice, taken from NOAA 56 on 22 May 2017 near Cape Lisburne, Alaska.